Are you starting off your day with a hot cup of plastic? Sometimes I wish I had an IV hooked up to me with coffee running through the tubes. If it weren’t for my fear of needles, or the awkwardness of rolling/hoisting the tower that holds the IV bags up and down stairs WHILE carrying laundry or making dinner, I’d be all over it. I like coffee and I like all kinds. I’m not a coffee-snob. It doesn’t have to be a particular brand or a particular strength. Sure I have my favorites, but if a cup is offered, I won’t say no. I sometimes drink it black, but my perfect morning cup includes one cup of coffee, one packet of Splenda and one tablespoon of coffee creamer. UPDATE: We no longer use Splenda as of January 2013! Ack! I’m craving a hot cup as I type this! When I started to seriously re-think what my family was eating, I started to read more labels. Besides the flavor of the coffee creamer, I never really read the label beyond the calorie and fat content. Once I realized that they’re all about the same, I stopped reading them. What mom has the time to read and re-read something they’ve already read? When I re-read the label about a month ago (to answer my own question of “what’s this stuff made of?”), I realized that 98% of my coffee creamer was made up of 3 ingredients: water, sugar, and partially hydrogenated soybean and/or cottonseed oil. I know what water is (although why we add something that’s primarily water TO coffee – which is also primarily water – is beyond me). Sugar is obvious too (but I’m still left wondering why I’m adding splenda…). Good news – we no longer use Splenda! See update above. But my knowledge of hydrogenated oil was minimal, so I did some research. THIS STUFF IS REALLY, REALLY BAD FOR YOU. In terms we can all understand, hydrogenated, partially hydrogenated and shortening are the “friendly” terms for trans fat. Manufacturers try to trick us into thinking we’re not consuming trans fat (because why would we think that these differently named items are really the same thing?) and just about every medical organization agrees that trans fat is bad for you. New York City has even banned trans fats from all of its restaurants (as of July 2008). But what exactly is the stuff? A trans fat is a perfectly good (and healthy) fat that’s forced to morph into something icky and in some ways, deadly. Trans fats are created in a lab. Manufacturers take an oil (palm, kernel, soybean, corn or coconut oil), inject it with a metal (nickel, platinum or aluminum) and this causes the molecules of the oil to rearrange themselves. At room temperature, the end result is either a semi-solid (a.k.a. partially hydrogenated) or solid oil (a.k.a. fully or just hydrogenated). If the fact that the oil is mixed with metal AND THEN WE CONSUME IT doesn’t gross you out, the molecular structure of the oil in this new state more closely resembles plastic than oil. In fact, you only have to change one molecule in order for this “oil” to become plastic! Can you imagine what your body has to do in order to process this almost-plastic substance through your bloodstream?! It’s no wonder why trans fat causes all sorts of health problems. It raises your bad cholesterol (LDL), lowers your good cholesterol (HDL), clogs your arteries (imagine soaking up dry flour with a sponge), is a major contributor to type 2 diabetes, and it’s been linked directly to coronary heart disease. Now I need to pause for a moment and interject some common sense here. I am not saying that if you drink coffee creamer you’ll get heart disease, diabetes or high cholesterol. I’m not saying that at all. What I am saying is that coffee creamer is comprised of a key ingredient THAT DOES cause heart disease, diabetes and high cholesterol. I honestly didn’t think that oil was in my coffee creamer. Those manufacturers are sneaky. They’ll do whatever it takes to make their products taste good. I can’t even imagine how many other products in my pantry have some sort of trans fat in them. And that’s the scary part. We don’t even know how much of what we eat has this morphed oil in it. I’ve been consuming near-cellulose oil for YEARS… and who knows the effect it has had on my body. But I do know this: cutting it out won’t hurt me. And consuming all other hydrogenated oils. Over the next few months, I plan to seriously consider each item that’s in my pantry and make a valiant effort to rid our house of trans fat. Do I sound a little crazy? Am I going overboard? I don’t think so. This battle isn’t just about me. I have a family to take care of. The decisions I make today, the decisions I make in the grocery stores, affect these guys. Now when I first discovered the nasty truth hidden in my coffee creamer, I simply went to black coffee. I do like it like that. However, there are some days when you need to mix it up. In steps homemade vanilla bean creamer. This stuff even tastes better than the store bought stuff! Since homemade vanilla bean creamer is a little time consuming and I quickly run out because its so delicious, I started using half and half with splenda. (Shortly after, we cut splenda too so I switched to a little maple syrup if I needed some sweetness.) But of course one day we ran out of half and half so milk was the obvious substitute. And it was still just as delicious. What Should I Do About Hydrogenated Oils? If you’re going through your pantry and removing items with harmful ingredients, then anything with hydrogenated oils needs to go. 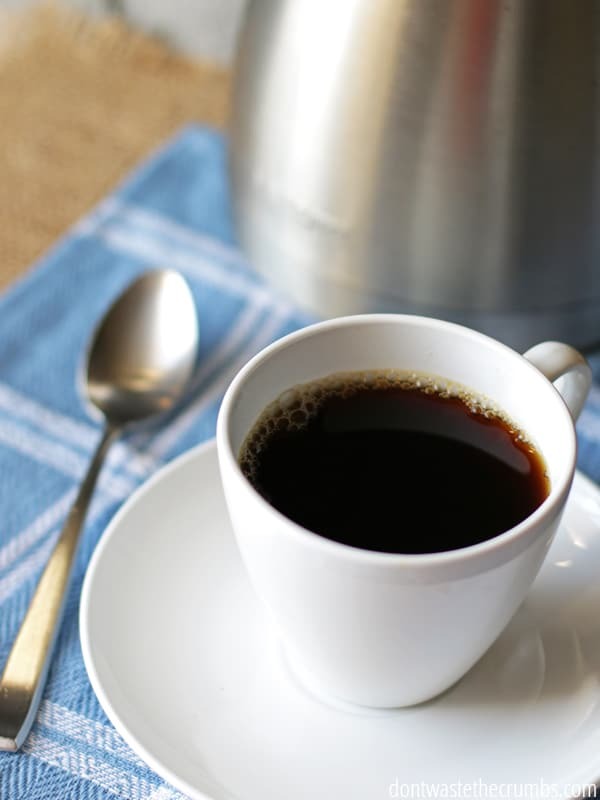 Replacing something like coffee creamer, you best bet is to go black, make one of the above homemade creamers, or simply use cream and sweetener. Other items, like tortillas and peanut butter, can either be made from scratch (these tortillas are SO GOOD) or purchased if you are diligent to double check the ingredient list. Amazon – if you try one month free of Amazon Prime, you get free 2-day shipping and access to Prime Pantry for groceries. Vitacost – They often have good sales that include free shipping. Click HERE to see what’s on sale. Tropical Traditions – While Tropical Traditions is known for their coconut oil, they also have other foods with real ingredients and often offer free shipping for bulk orders. Have you been starting off your day with a hot cup of plastic? High Fructose Corn Syrup: Why it's Bad For You! Also: it tastes nasty. Unlike half-and-half which is ambrosial. One thing that really cemented our desire to eat high quality whole foods we recognized was having a toddler in a diaper. After seeing what processed food does on the other end compared to healthy whole foods, it made us wonder why on earth we would willingly put such things in our bodies. The only time I’ve used coffee creamer is after my last baby was born when I had to give up dairy. Then when I partially came out of my post baby brain fog I realized that it had dairy in it plus more. So I stopped using it. I use whole cream until recently when I had to give up dairy again, now it’s just a bit of coconut oil. I’m re-evaluating everything we eat too- very eye opening! Mmm, whole cream sounds heavenly! I’m a fan of coconut oil, but I haven’t tried it in coffee yet. Very eye opening indeed!! Your statement is incorrect. You are either misinformed or you are deliberately lying. He’s actually right. the ‘trans’ part in ‘trans fat’ refers to how the hydrogens in a carbon chain are arranged relative to a carbon to carbon double bond. if a fat is fully hydrogenated then by definition it has no remaining double bonds and can’t be a trans fat. You should do your own research properly before calling people out online. Also if you read the nutritional information panel that you yourself posted with the article you will notice that it says 0% trans fats. This is to Adam…You are so rude!!! You can dispute the answer but in a more mature way than accusing someone of lying. You are an insult to the human race….now I’m being rude…you brought that out in me! Even though we know that fully hydrogenated oil does not contain trans fat, until legal action is taken to ban trans fats forever, they will probably misunderstand what is at stake and do a sloppy job at hydrogenating. My son has put it in his coffee and a dab of butter. Why? There is something about what is in both that together wakes you up mentally. He’s got all the science figured out. I’ve tried it and it does work. Approximate measure: A teaspoon of coconut oil and a pad of butter to a full cup. I also recently discovered that a tsp of coconut oil makes a smooth and mellow cup of ‘black’ coffee. I’ve used butter on occasion for a few years, but really like the coconut oil better. I also recycled a maple syrup jug as a ‘coffee-creamer’ container, fill with whole milk and add a TBS of pure vanilla extract to the 16 oz container. I’m just trying to eliminate all artificial chemicals from my diet. Is there much sugar in whole cream? There’s lactose in dairy, which is a natural sugar, but there shouldn’t be any added sugar in whole cream. Just wanted to know yoy can make condensed milk at home. Visit down to earth blog. Thanks for the tip Lindel! Why not go to the next step and quit drinking coffee altogether? Imagine how much money you would save. Imagine how much time you would save not making, pouring, cleaning up after coffee! I quit drinking coffee over 20 years ago and although the aroma still arouses my senses, I don’t miss it at all. In fact my physical well being is much better because of it……no more caffeine rattling my nervous system. reading that makes me sad… i loooove my coffee. I can drink regular coffee at 7pm at night and have no issues falling asleep at 10pm. Wow – lucky you! I’ll admit that creamer is tasty, but since switching to half & half, I’m enjoying the COFFEE flavor a bit more and not tasting so much of the artificial flavor. I’m looking forward to the holidays when all the fun flavors of coffee come out! 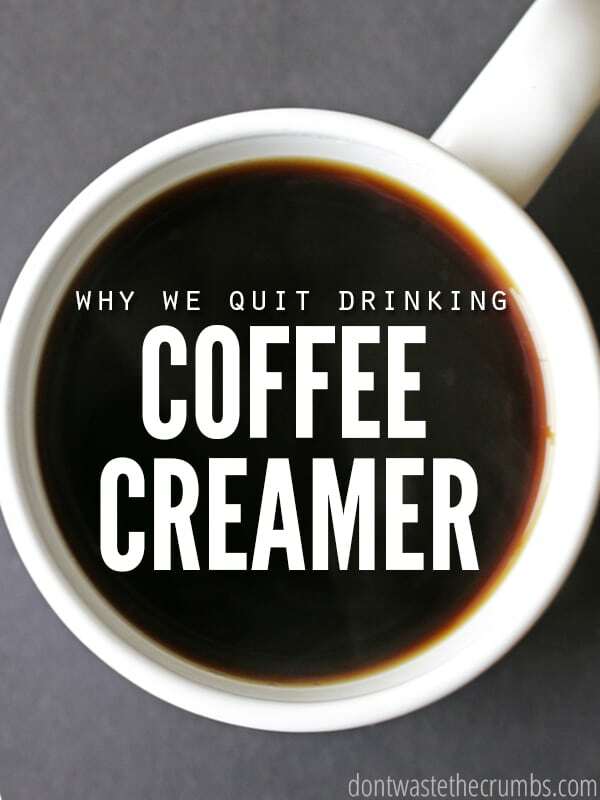 I stopped using artificial creamers decades ago..and now–I can’t stand them. Other than a specialty coffee now and then..I use half and half and–thats it. No sweeteners. Hi Jim! Taking coffee away from a mom of two pre-schoolers may not go over so well. 😉 Although since we’ve increased our fruit and veggies, we’ve been drinking less coffee each morning! Jim – no coffee !?!? That is so disguting ! Plain old cream is better for you then that! I may have to throw out the little packets of hot chocolate mix! I bet that is in there! I read recently that you can make your own chocolate syrup and add it to hot milk…. I’m a newer reader but we cut out processed foods at the beginning of the year and then made the switch to a plant based diet in March but before we went plant based this was the recipe I used for coffee creamer. I no longer use creamer just drink my coffee black (as long as it is good organic stuff). If I am at somebody else’s house I add a spoonful of maple syrup. Love Carrie’s site – her pumpkin coffee creamer is one of my favorites! Mmmm…. haven’t tried maple syrup yet, sounds yummy! I think it’s a bit of laziness as to me not making my own. I thought I would eventually, but I’ve been drinking half/half for so long that now I’m just used to it, lol. I use almond milk. I heat it in a stainless steel pan on the stove while whisking it to a quite firm foam. Heating it takes away most of the almond taste. I pour the foam on the half full cup of coffee. By the time I’m ready to sit down to enjoy my supps the foamhas released some almond milk into the coffee turning a pretty color. I have some friends who do something similar and they enjoy it that way as well. We don’t drink almond milk anymore, but the slight taste was nice! Giving up creamer is a great first step, but Splenda should definitely be the next thing you give up. Read up on the toxic chemical mess that is and how it was discovered. It is just as bad as the trans fat you are trying to rid yourself of. I have been cutting down my coffee consumption and I have learned to enjoy it “Bulletproof” it is what many people following a Paleo lifestyle drink. Using an immersion blender or something similar, add 1 T Coconut oil and 1 T grass fed butter with a few drops of Stevia. I like Vanilla Cream. Blend. It makes a great creamy treat with good healthy fats. Yum! This post is from last summer, so I should update that I we officially ditched Splenda as of January 1! I’ve been adding NuNaturals stevia with half and half and enjoying it immensely. I’ll have to give your coconut oil/butter/stevia blend a try! I am a health and wellness professional and I have a soap box about food labels in general and what they are able to get away with! Yeah for ditching Splenda as well – also one of my comments until you updated again! Here is what I learned LONG ago – I would rather have a little less of NATURAL goodies than garbage any day – like 1/2 and 1/2, ice cream, whatever. AND here is an easy tip for everyone – they flavor processed foods with only 3 things, all cheap – fat, sugar or salt/sodium. SO, if they claim one thing like LOW FAT or FAT FREE, I guarantee you one or both of the other two are higher. I am not certian today, but I think Reduced Fat Oreos is a situation where the lower fat version has more sugar, likely sodium too and ends up being more overall calories! Again, not sure, disclaimer, haha! But it can happen. So, you have to pay attention to waht issues you are at risk for – sugars, fats, high blood pressure and sodium content? You would indeed be surprised when reading labels, oh my! Good job paying attention in general and TRYING…better than most! Another thing I can’t stand is the stamps all over – Heart Healthy – American Heart Association, or whoever, typically PAYS to put those things on, partner, everyone is in bed with everyone else -so reading the LABEL helps more than this or that….REALLLLLY??? Fruit Loops are a part of a heart healthy diet??? I think not…. I had my kiddos start reading lables, particularly with cereal, and gave them a sugar gram limit, as well as a minimum fiber amount adn THEY were surprised as to what they thought was healthy and was indeed not…awesome revelations! I totally agree with your soap box issues and would speak out more often, except that it’s a tough box for me to get off of so I just avoid it for now. I think I saw a vegan experiment documentary where they showed Oreos as being vegan, yet they touted vegan as healthy… so Oreos are healthy? I think not. I just bought creamer from sprouts thinking oh it’s sprouts I don’t have to read the label. Nope all bad so bummed and sick of going into allegedly “healthy” “natural ” grocery stores to find out its crap or its from china. Anyway here’s a great coffee creamer recipe I thought I’d share. Whisk together milk, cream, maple syrup and cinnamon in a medium saucepan over medium heat. When the mixture begins to steam, remove from the heat. Stir in extracts. Strain through a fine mesh sieve (I didn’t, no big deal), pour into a glass bottle and store in the refrigerator. Will keep for 10 days. We ditched our coffee creamer a while back too. I even managed to convince my hubby to give it up! All we do now is cream and sugar (we really like Demerara yum!). Sometimes I add some homemade vanilla extract too. I have also made vanilla syrup with about 2 cups sugar, 1 cup water, and 4tbsp vanilla extract. Boil until sugar is dissolved and it has thickened a bit. I keep it in the fridge and it doesn’t really go bad. At least mine never has before I finish it. Then I just pour some of that in with some cream and YUM! I tried the milk based homemade recipes but it was a nuisance to have to make it so frequently. I also like that, with the syrup, I can put it in my (homemade) yogurt too. Just make sure that you’re using raw milk and cream, otherwise you are still using useless products that are nothing but chemicals or chemical derivatives. $20 per gallon? Whew! That’s just criminal. Yep. I feel the same way. Trust me, I WANT raw milk, but it requires a lot of cut backs in other areas, or at least a good bit of clearanced meat deals, to free up the funds, lol. Okay, so you think trans fats are bad for you, but you use Splenda? Have you done your research on artificial sweeteners? That is also made in a lab and really, really bad for your body. Hi Stacy – I used Splenda at the time of the post, but our house has been a Splenda-free zone for over a year! While you’re at it you should look into the splenda garbage you put in your coffee. Good news Crys – we’ve been Splenda-free for a full year now! You can take this whole “ban everything” a little too far. Not only are you going to make your children neurotic nutcases, you can very easily get into that holier-than-thou annoy everyone in your life area. The whole “we eat only dirt and water” movement gets on my nerves. Being healthy is one thing but people go too far. I get horrible heartburn when I utilize any of the “fake” creamers. I have been resorting to milk (no condensed milk or cream in the house) and it just waters down the coffee. Today I put a little “fake” creamer in and low and behold within 30 minutes I had heartburn. This was a nice little reminder to just throw it away and go get the good stuff. Shake it up and store in frig – goes with all flavors of coffee! Great job! I have done the same thing, I went to 1/2 & 1/2 with one spoon of organic sugar. Then a few months ago I switched to coconut sugar which is way less sweet. it gives just a hint of sweet but lets the coffee flavor still come through. I do, on occasion, still get a Starbucks, but my favorite trick there is to order a grande iced coffee (plain) then you can add a flavor if desired and they have 1/2&1/2 you can add youself, and it is way cheaper than any of their specialty drinks with less junk! Hey everyone, I’m glad I stumbled across this site in my google search for “how bad are coffee whiteners”…we are not wanting to give up coffee at all, but are killing ourselves finding a non dairy alternative for cream or whiteners because of lactose issues…also wanting to eliminate white sugar but not wanting to do the artificial sweetener thing….help? Scott, are you really lactose intolerant with regards to cream? I don’t mean half and half. Most people can tolerate cream or cream that does not have milk and other thickening additives, in it. Hi Scott – raw cream is generally tolerated well by lactose-intolerant folks. If that’s a no-go still (for whatever reason), try coconut milk, cashew milk or almond milk. All of those are milk in flavor and can be made from scratch, allowing you to determine the thickness (for cream, or for milk) without any additives or junk. For the sweetener, try coconut palm sugar, maple syrup or stevia. The first two are natural sweeteners, with maple syrup being the most affordable. Stevia is extracted from a plant and the NuNaturals brand has a very mild taste to it (this vanilla variety is my FAV). Stumbled upon your website while searching for a healthier coffee creamer. I’ll have to give some of these suggestions a try. BTW, we switched to a “healthy” coffee as well to reduce our acid intake, which is vital for overall health. Provides a variety of specific health benefits as well. Let me know if you’d like more info. “Healthy” coffee… Hmmm… sure, go ahead and send me more info. Thanks Ron! I hope you enjoy the creamer options!! Just a few comments here. What, exactly, is the parts per million of these “metals” you are using as a scare tactic to make your point? Are they higher than the same ppm of the same metals in common air? Should we all stop breathing to be healthier? 2nd, in which way exactly, is a 0 cholesterol PLANT oil worse for you than an animal fat oil found in dairy milk, cream, and lard (not shortening). 3rdly, one molecule is a huge amount to consider. It is basically the difference between life or death. o2 is one molecule of oxygen, which we breath quite nicely. H2-0 is water.. considerably harder to breath. Saying that coffee whitener is akin to plastic is like saying oxygen is akin to water… it just isn’t so. A major proof to this, is coffee whitener is organic and will break down, unlike plastic which is pretty much with us forever. I have been using coffee whitener for years, and to this date, I have never pooped out a lego block. Animal fats like those found in dairy milk, cream and lard are actually very good for you as they are direct from nature. The vegetable blended oils are modified in labs, created through chemical reactions and cannot be found in nature as-is. I don’t know the PPM of the metals they use to make coffee creamer, because that’s not my point. The fact that these ingredients are not real, created through chemical reactions in a lab, is. I simply don’t want my family to eat these types of foods. Also, just because you don’t see any immediate illness, doesn’t mean the food you eat doesn’t effect your body. I just found your website today and have been reading through many of the articles. I think you have some really good ideas and set an excellent example for people trying to eat more “real food” and feed their kids a healthier diet. However, I think Gary and Bob Marley above him have a good point, even if they could have stated it in a way that doesn’t force you into a defensive position. When I read several of your posts, you, intentionally or not, portray yourself as very anti-lab, which most people will take to the next step, that you are anti-science. Trans fats aren’t made in labs. I’m a scientist and I work in a lab. Trans fats are made in factories, just like the stevia sweeteners you use. They use natural ingredients, just like your all natural sweeteners. They are subjected to chemical and physical processes to turn them into a convience product, processes that were invented in experimental food labs (just like stevia sweeteners). I’m not saying trans fats are good (they’re not) or stevia is bad (Meh), but labs and food science aren’t inherently bad. You know the commercial “fake food” industry publishes biased or even fake science to sell their products for money. Think about this: “real food” has become a HUGE industry too. Frequently they sell fear, because that sells “natural” products, regardless of whether or not they’re better. The vast majority of studies are deeply biased and written to “prove” something, rather than discover the truth. Science is like a small child, it is easy to manipulate or abuse, but not inherently bad. There are no (or very few) evil scientists. All scientists try the best they can with the resources and information they have. Question everybody, even the “natural” companies. They’re for profit too. They all are chemicals, Human are chemicals made of molecules. You are wrong about cotton. Natural cotton comes in a wide variety of natural colors. I have a “beginners” cotton spinning kit and it came with 6 different colors (and breeds) of cotton sliver to spin. Most colored cottons have a shorter staple length than the commonly used Pima or Egyptian white cottons, and so are not suited to most commercial use, but are still heavily favored by hand spinners. “Just sometime people should not comment on things they have no clue about” indeed! From a Nurse’s view: Be happy your HDL is high. That is the good cholesterol that pushes the bad LDL out of your arteries. Keep doing what your are doing. HDL is the so-called “good” cholesterol. LDL is the one they tell us to watch out for. From what I have read on the subject, and I am no expert, the ratio of HDL & LDL can help tell you how great your risk of heart attack is. The higher the HDL the lower the risk is my understanding. I’m confused – the nutrition label says Trans Fat is zero doesn’t this mean that the amount is so small it’s negligible? Hi Jodi! The numbers on the nutrition label are per serving, and companies can put “0” if the amount is equal to or less than 0.5g per serving. What usually happens is that the serving size is manipulated smaller so that the trans fat per serving can be listed as zero. Skip the nutrition labels and read the ingredients instead. If you find “hydrogenated” in any form, it has trans fat, and in my opinion, that stuff is so bad that there’s no amount considered negligible. Thanks for the quick reply Tiffany. I am sad now, very very sad, I’ve given up sugar, white flour and Splenda – for several years – a cup of coffee (with way too much powdered creamer) has become my reward, the only treat left (besides almond butter). I’ve tried all the alternatives but I don’t like any of them. Honestly, I’m not sure it’s worth it. Before I even opened this up, just by reading the link from the homemade coffee page, I already had a feeling it was about partially hydrogenated soybean oils and monodiglycerids(sorry, I don’t know how to spell it lol).. my mom stopped using coffee creamer for the same reason and now she watches the ingredients too to make sure they’re not in what she eats, since our family has a history of heart problems and all it does it clog your arteries. I’m still trying to give to coffee creamer 🙁 I’m only 20 though, so my chances are slimmer for any heart problems.. for now at least. Personally I switched to a ‘healthier’ coffee just on a year ago and was so impressed that I got involved in the marketing of the product. A six year old company with about $500 Million annual turnover and available in close to 40 countries worldwide (and growing). Happy to provide you more info if you like. Hi Rob! Thanks for chiming in here. If you’re interested in discussing products with me, I encourage you to email me directly. Thanks! I enjoyed your post Tiffany! I also wanted to add something that you, and your readers, might find interesting. Or if you’re like me, disturbing. As I was enjoying my cup of coffee this morning, doctored with a little fat-free (I know, I know…shame on me!) Coffee-Mate creamer, I took the opportunity to read the ingredients. In addition to the yucky stuff you pointed out, coffee-mate creamer also contains “dipotassium phosphate” which is made up of Phosphoric Acid!! Needless to say, no more Coffee-Mate for me……. Yikes – what a way to ruin a good cup of coffee! Glad you found it sooner rather than later. Thanks for sharing Nikki! You can make a pretty good coffee creamer with almonds. If you have a high speed or even a food processor. All you have to do is soak the almonds overnight, then blend with 2 parts water (say 1/2 cup almonds to 1 cup water), strain and you have coffee creamer. You can add vanilla or whatever you want in it I just like it plain. The only drawback is that it won’t keep in the refrigerator very long, just about 3 days, so I make a very small amount at a time. I’m going to try freezing it in an ice cube tray so I can just thaw out once cube at a time but don’t know yet if that will work or not. Anyway, this makes a really good dairy-free creamer with no chemicals or preservatives. I just wonder why the FDA allows such items to be sold? Companies make them cheap and yet they charge the consumers heavily while the consumers are not only paying so much money, they are also being prepared for their healthcare bills. I just don’t get it. Why is it allowed? This is just one example of 1000’s of other items that are allowed with “hidden” ingredients that only scientists could understand. I know I am exaggerating but then again if we are all to look out for ourselves then this is even more messed up. I know I sound like I am fed up with these things, that’s because I am. It’s not fair to consumers like all of us here that have to simple “deal with it”. You could dodge one thing or another, but you cannot avoid eating and escape such ingredients completely. I used to make my coffee the night before and put it in the fridge to save time in the morning. When I got my coffee out in the morning, I would find these odd white lumps floating at the top and I knew it had to do something with the coffee creamer. It was disgusting, yet typically this would not show up when the coffee was warm. Mix 1/4 cup of water with 1 cup of sugar over low heat until the sugar melts, then turn up the heat and cover to brown the mixture. When the mixture becomes a golden-amber color, remove from heat and add the rest of the water and cool. You can mix it with the milk or keep it separately; either way, the mixture shouldn’t separate when cooled. This website is amazing!! I’ve been on it for the past hour, writing down a shopping list only to realize that I already own 90% of the ingredients! I’m looking forward to visiting this site more! I have to think that this report is unbiased as it is based entirely on empirical data collected on both humans and laboratory animals, but nevertheless, it couldn’t hurt you to cut it out of your diet. I personally will not be doing that, as I do love coffee creamer containing PHSO, I will simply continue using it in moderation. I’ve been a coffee mate addict for a LONG time. Recently I decided to give it up for reasons similar to what you’ve described here. I’ve switched to a half-and-half mix of unsweetened vanilla almond milk and heavy whipping cream (actually it’s 3/4 almond milk, 1/4 cream), and some Stevia. I feel better about this…but not really physically better, yet. Hopefully that comes with time. I’m drinking less coffee now, too, so I’m feeling the withdrawal effects…. definitely a process..
Any advice on how to give this a little more flavor? I wanted to love it but it just want what I expected. Im very newly switching to a more natural home. Started with makeup and beauty products and am now looking for cheaper but healthier alternatives in the kitchen. Like I drink/buy a disgusting amount of creamer so making my own saves money and is healthier, that’s a win for me! Coffee mate makes a natural blend that doesn’t contain the partially hydrogenated soybean oil, just buy that, it’s good. I’m so thankful I’ve found your website. I’m slowly transitioning to a whole foods diet and the recipes and articles have been a great help and encouragement. I love love love vanilla creamer but I can’t stomach the ingredients in the store bought products anymore. I’m looking forward to trying this recipe. What brand of vanilla bean powder do you use? I’m having a hard time finding it. Thanks! I drink Bulletproof coffee every morning and skip breakfast. This holds me to 2PM when I have my first meal of the day.